Assist the membership in the pursuit of justice and in all matters relating to the execution of their duties. 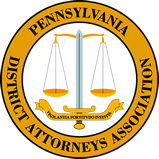 Advocate the position of the Association to the government and citizens of Pennsylvania. Coordinate with other agencies on matters of mutual concern. Communicate the Association’s position to its membership and the public on criminal justice matters.